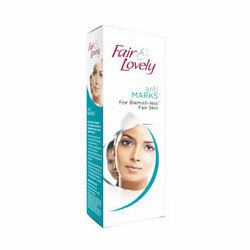 Buy Fair & Lovely Anti Marks for Pimple Free Skin. Lightens different Kinds of marks. Helps prevent spots from coming back Get visble fairness. Blemish-less Fair Skin in 4 Weeks. New Fair & Lovely Anti Marks has a breakthrough Spot-Block system that not just fades current pimple spots but also prevents them from coming back. It also blocks dark pigments and prevents them from spreading anymore. - Lightens different Kinds of marks. - Helps prevent spots from coming back Get visble fairness. Result : Blemish-less fair skin in 4 weeks. How does this cream fade marks and helps from coming back? • Vita-Aloe complex with vitamins B3 & E, Aloe vera concentrate and druit princples, target blemished areas of your skin to effectively lighten marks and fight excessive pigmentation build-up. • Triple sunscreens with broad spectrum sun protection and TPI 60 help prevent UV rays from triggering darkening and reapperance of marks.